Rascarrel Bay Lodges offers bespoke self-catering accommodation in a peaceful, secluded, farm estate based on the heart of the Solway Coast, near Castle Douglas. These beautiful bespoke detached properties offer luxurious accommodation nestled in a private peaceful bay within a stone’s throw away from the sea shore but yet close to all local amenities. Located only 2 miles from the village of Auchencarin and 11 miles from Castle Douglas making this a fantastic base to explore the areas natural beauty and wildlife, or just to relax and look out to sea from the lodges and you may even spot the dolphins. There are numerous attractions close by including, Sweetheart Abbey, Galloway wildlife conservation park, Drumlanrig castle, Broughton house & gardens, Caerlaverock castle, The summer gallery, Threave castle & gardens, Ellisland farm, Robert Burns house & museum, Dundrennan abbey, Loch Ken water sports, The Stewartry museum, many golf courses including Colvend, New Galloway & Dalbeattie. 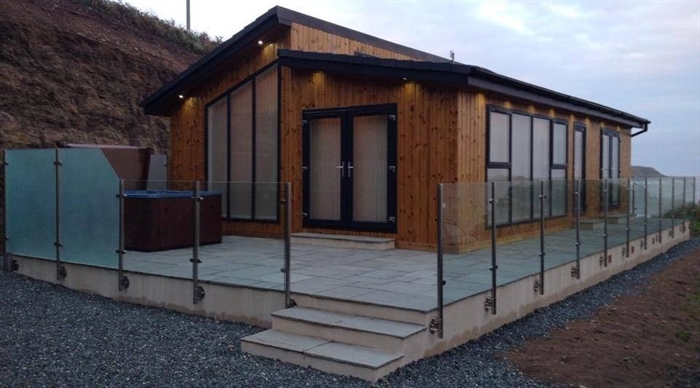 This stunning single storey accommodation offers ONE bedroom: king-size with beautiful sea views, flatscreen TV with freeview, Blu-ray DVD, iPod dock and patio doors leading out to enclosed balcony. Bathroom: large with bath and separate shower cubical, his and hers sinks and WC and an additional WC. Lounge/kitchen/diner: spacious open-plan room with large flatscreen TV with Blu-ray DVD, freeview, wi-fi and feature fire. Kitchen area, modern well-equipped, with wine-cooler, gas oven and hob, fridge/freezer, microwave, dishwasher and large dining table. Utility: with washing machine and tumble dryer.